Thank you to all who tuned in to watch the live YouTube streaming today! It happened again on my way to the temple this morning: I saw a deer, a buck with antlers this time. Many times when stepping out of my home, I see one or more deer. Upon seeing them, I put my palms together and stand respectfully in their presence. The deer stop scurrying, turn, and look at me peacefully, yet with interest. They stay calmly with me until I begin to walk away. They are also most intrigued when I chant a Mantra softly. They listen attentively until I finish. The sun and moon’s rays have an effect on the earth. Of course, when we refer to “rays” here, we mean it not just on the more superficial levels, but also on the astrological and Transcendental level. Normal sun and moon shine create a normal environment for the earth. Physical earth is made up of the five elements and those five elements have a certain balance under normal conditions. The same is true with our physiology. The eclipse affects the sun and moon rays, creating an abnormal environment for the earth. This also upsets the balance of the five elements, upsetting our environment on earth and also our physiology, including our mind and emotions. Scientists have done research and found that during an eclipse, there is an increase in bacteria and viruses. Because there is imbalance physically, it is suggested that people not eat or drink because the body does not process food and water correctly. It is a little bit like avoiding certain foods when a person is sick. Some do not eat from sunrise to sunset that day and others just avoid eating near the time of the actual eclipse. Because there is an imbalance mentally and emotionally, it is suggested that people go inward and meditate or chant mantras. It is advised not to look at eclipses. Even if you do not look at the eclipse, the effects of an eclipse last 3-6 months. It states in the Vedas that as a result of an eclipse, there can be changes in nature and natural disasters can occur. For people, with the lunar eclipse, the effect is on the mind/emotions, whereas with the solar eclipse, the effect is more on the whole body and health. During the whole solar eclipse (in Asheville, this would be from 1:00-4:05pm), it is best to stay inside and not look outside or even allow light in. During the eclipse, it is best to meditate or chant, and it is a good time to go inward. Finish solid food 3 hours prior to the start of the eclipse and wait to eat 2 hours after the eclipse ends. Shower right after the eclipse and then you can start cooking. Don’t save cooked food to eat after the eclipse, including in the refrigerator. No showering, drinking, or eating during the eclipse. This particular eclipse especially affects those people whose Moon is in the sign of Cancer, Leo, or Virgo in their Jyotish (Vedic astrology) chart. Those people whose Moon is in Scorpio or Pisces also need to make sure to follow the guidelines suggested above. 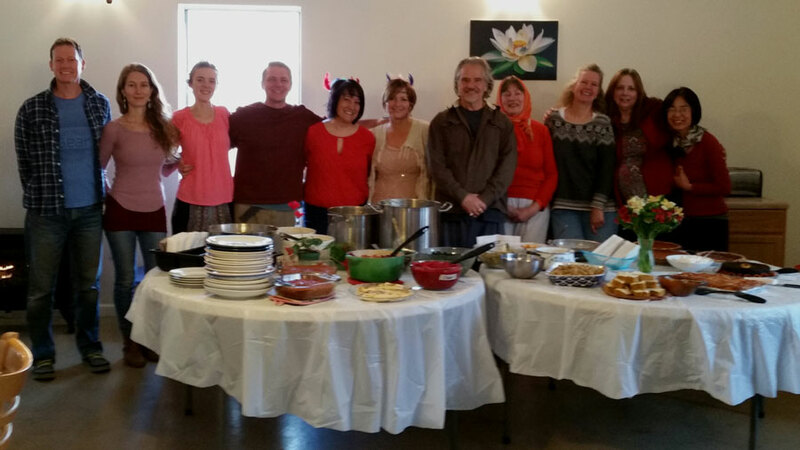 Hanuman Jayanthi at Mount Soma! May 20, 2017 was another great day. Lots of people fillled Hanuman Park for Hanuman Jayanthi. The chanting and bhajans were wonderful. The feeling of family, community and devotion filled the air. Beautiful! View more pictures on the Hanuman Jayanthi Photo Gallery. 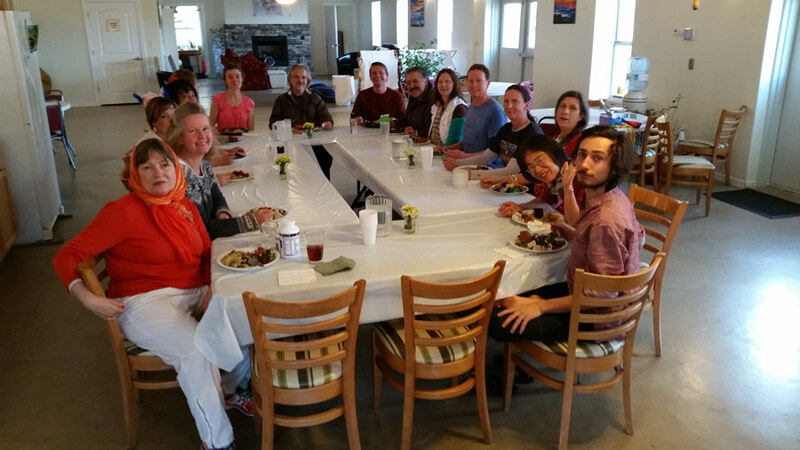 We had a wonderful early Thanksgiving today, Tuesday, Nov. 22 at Mount Soma because Thursday will be busy with guests. It was a potluck with tofu and lentil loaf turkey, and all the trimmings. After the feast, a bunch of us took a walk out past the Wishing Tree through the mountain trails. It was lovely. We found a quiet spot with a very fine feeling and stood there together for quite a while… chatting a bit, listening to the stillness of the woods, looking at the views and fidgeting with twigs, fall leaves, and other little treasures of nature. It was an exquisite day as we all enjoyed the food, the walk, the environment, and most of all, one another.